The audience of Jawahar Kala Kendra (JKK) was left spellbound by mesmerising dance and music performances from Assam. As a part of the programme ‘Aik Bharat Shresth Bharat’, JKK featured dancers and musicians from Assam who performed Bihu, Bodo, Jhumar, Satriya as well as a special musical fusion by Agragami. The jubilant dance forms of Assam depicted the culture of State with energetic dance steps and hand movements. The performers were adorned in traditional Assamese attire and showcased the best of their talent with synchronized choreography. The highlights of the event included ‘Kuhipat Bihu Husori Dol’ who presented the indigenous dance of Assam – ‘Bihu’. The dance was choreographed by Abantika Parashar. 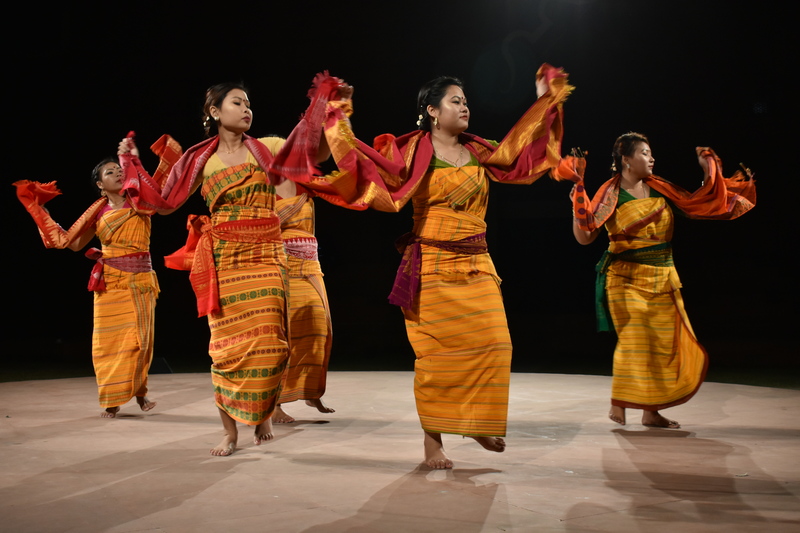 Similarly, ‘Birina Bodo Cultural Group’ presented the ‘Bodo’ dance choreographed by Pranab Borah. The dancers performed the traditional dance to the ‘Bagurumba’ song. Other than this, ‘Bodoisila Jhumur Dol’ performed ‘Jhumur’ dance choreographed by Deepak Borah. This dance carried the tea culture of India. Also, ‘Luit Poriya Dol’ presented ‘Sattriya’. Recognised as a classical Indian dance form –‘Sattriya’ is a dance-drama with origins in the Krishna-Vaishnavism. The star attraction of the show was the ‘Agragami Folk Fusion’ choreographed by Nabamallika Bhagabati. The dance presented a visual representation of the diverse ethnicity of Assam. The performers showcased a fusion of Rabha, Hajong, Mishing, Boro, Jhumur as well as Bihu. The audience truly enjoyed the unique tribal folk songs.